Using information on the rotational barrier of butane, which is about 4.5 kcal/mol, we can add more information to our basis set. We will also use information from other sources to build a more complete picture. In ethane, there is no steric strain, because the hydrogens are too far apart to crowd each other. In propane (CH3CH2CH3), the hydrogens on the first and third carbon are close to each other, but hardly cause any crowding. In butane's anti conformer, there is no steric strain, because the methyl groups are far apart. In butane's least stable eclipsed conformer, with the methyls eclipsed, there is about 1.5 kcal/mol of steric strain. The 1.5 kcal sterics plus 3 kcal torsion equals the rotational barrier. In butane's gauche conformer, there is no torsion, but the amount of sterics appears to be only a little less than when the methyls are eclipsed. One simple method of assessing steric strain, without memorizing a big table of information, is use an atom counting method. Count from one hydrogen, to the next atom, and so on to the other hydrogen that seems likely to interact with the first. In ethane, this distance is four atoms (H-C-C-H). In propane it is five. In butane it is six. 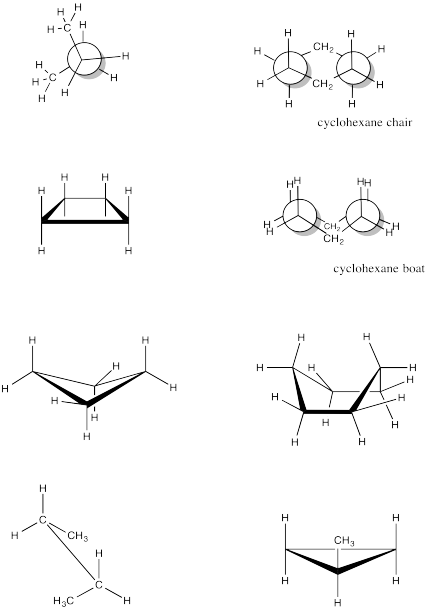 The potential steric interaction in butane is accordingly called a six atom interaction. The basis set used in this method is given in the table below. Note that a methyl (CH3) group can always rotate, so multiple hydrogens on one methyl group could potentially interact with multiple hydrogens on another, but not at one time. We only need to take into account the full interactions that could happen simultaneously. Calculate the torsional strain in the following cases. 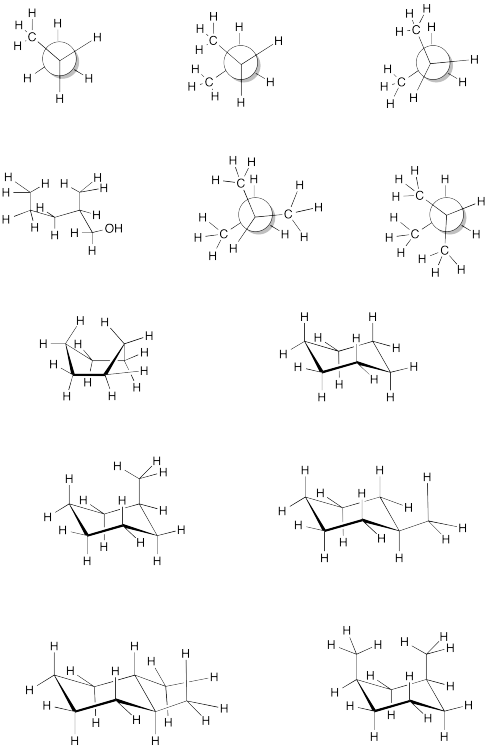 Find all 6 atom interactions in the following pictures.